There was a time that a multi-fuel stove was a short, squat bock of cast iron sat in the hearth designed purely for radiating heat into the room and faded into the background when not serving its purpose. That all changes with the Carillion from Broseley, this widescreen stove is designed to be the centre of attention in your living room. The unique central column rotates through 90° thanks to a revolutionary new air intake system. This allows the stove to be pointed at the part of the room you desire, affording uninterrupted panoramic views of the roaring multi-fuel fire while up to 78% efficiency ensures that the maximum possible heat is generated. 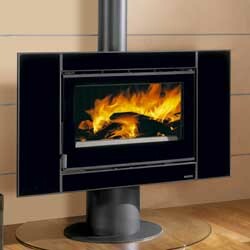 The striking lines or the frame and bold crystal black finish really give a futuristic feel and the steel column combine to give a very futurist and modern twist on a traditional multi-fuel stove. This is accentuated by the 16:9 widescreen viewing window really allows the flames to come to life in a way you will not find in any other multi-fuel stove.